The Orb - First, Consider The Lillys. 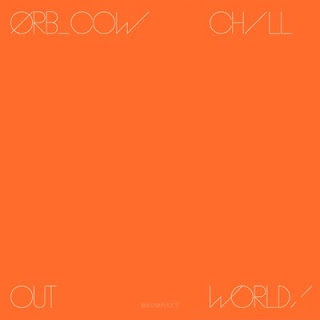 Background promo - The duo known for their genre-bending curiosity and surprising sonic detours, that explore experimental soundscapes as well as club-friendly beats, legendary and celebrated ambient kingpins, The Orb, premiere their 16th album, "COW / Chill Out, World!" this week via The Vinyl Factory, and on Kompakt from Friday, October 14. In support of the LP release, The Orb kick off the first leg of their North American tour on October 19, which sees them bringing their critically aclaimed live shows to both the east and west coasts. A performance The Times gives a four star review saying, "Less a 'gig', more of a happening with a sense of vast sonic irreverence." Saint Marilyn - Frustrate Me. Background promo - Brooklyn-based synth-pop duo Saint Marilyn released their track "Frustrate Me". The single marries hazy psych-pop synths, dub scattered drumbeats and spine-chilling vocals. 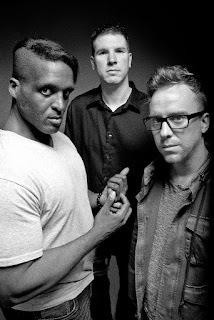 Vocalist/drummer Che Houston opened up to them about the track: “We wanted there to be an indecisive aspect to the way the synthesizers bend and move, to emulate the fluctuations of emotion in a personal conflict." After releasing their EP 'Shoshone' last year, the band flourished with a dancy high-energy live-show, integrating live drums and bass into their sound, and making rounds at popular New York venues. "Frustate Me" comes ahead of a full-length release, set to come out in 2017, which will see them experimenting with elements of house and psych-pop. They'll play two New York dates this month, at C'mon Everybody on October 18th, and at Bowery Electric on October 25th. Facebook here. The Mystic Underground - Here In My House. Background promo - Synths and sass. Pomp and circumstance. Two simple phrases. Two small glimpses into the minds of singer Vladimir Valette and producer Benedetto Socci. Together, the two combine to form the nucleus of indie electronic pop outfit The Mystic Underground. With inspiration found in the sounds of machines with the warmth and immediacy of the hummable melody, the New York band are primed to inscribe their mark on the pop landscape with their forthcoming LP entitled simply 'Protagonist' due out on the 18th of November on the band's Stereosonic label. Yes Sir Noceur - Turn To Fire (feat. Aquila Young). Background promo - Yes Sir Noceur are chuffed as chips to release the first taster of their sophomore EP. Striking while the iron is hot following on from previous singles, 'Luna' and 'Dreamin', the group's new single, 'Turn To Fire' is out now via GD Frnds. Noceur (pronounced no-sir), one who sleeps late or not all; one who stays out late to revel or party. 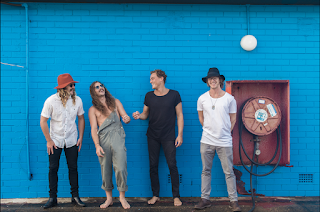 With a charismatic tendency to refute genres and definitions, Gold Coast's Yes Sir Noceur have developed a cult-like following of music lovers enamoured by the band's Zeppelin-esque riffs and surf-infused, psychedelic rock. Refusing to be pigeonholed, Yes Sir Noceur casually flirt with genres to transcend the prevailing psychedelic sound of the moment. If Jim Morrison, Tame Impala and the Beach boys had a one night stand, Yes Sir Noceur would be their lovechild. Lowly Hounds - What Fools Will Do. 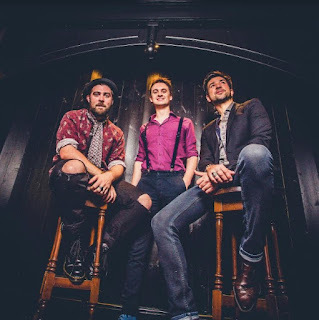 Background promo - London-based rock trio Lowly Hounds have announced the release of debut single What Fools Will Do (produced by Mike Quinn of Supergrass) on October 31st. The debut single encapsulates energetic rock at its very best with pounding drums, melodic keys and a forward driving guitar section. Lead singer Nick's lively and nostalgic rock vocals oozes charisma and he even hits some falsetto notes to top it all off! The trio are proud of their roots, a mix of Milton Keynes and Brazil! 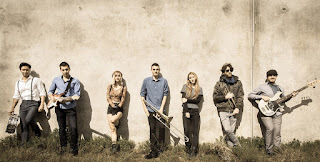 Which gives the band an interesting dynamic but they all share the same love of American blues, funk and soul, which in turn inspires their vintage edged music making together. Lowly Hounds live show is an energetic and enrapturing experience that takes you on a journey through a massive dynamic spectrum. However the band can also strip it back too after being asked to play an intimate show for the prestigious Sofar Sounds (London). Roy Harper - Flat Baroque and Berserk, Stormcock, and Lifemask. Biography - Few surviving songer-songwriters from the counterculture of the 60s have kept their reputations intact. Of the generation of troubadours who came of age in the London folk clubs of that era, some have passed away, while others have surrendered to the regurgitation of the blandest form of acoustic folk music. But among the survivors, there is one figure whose body of work, comprising 23 studio LPs and almost as many live and compilation releases, has come to stand for a particularly single-minded form of integrity. That man is Roy Harper. Mel Kay & Liberte - Upside Down Town. Background promo - Given she has been involved in music since the age of three, it’s little surprise Mel Kay chose to embark on a singing career. After years of studying contemporary music performance at WAAPA, the 22-year-old is set to release her latest singles ‘Upside Down Town’ and ‘Feel Alright’, both up-tempo tunes, mixing pop, indie and funk.